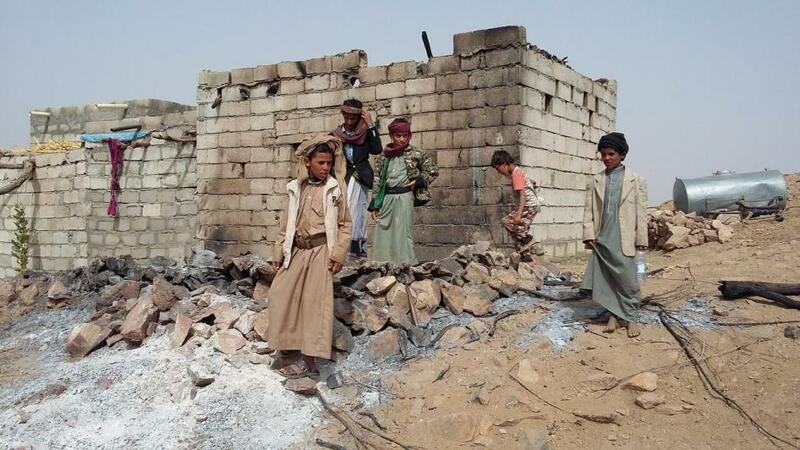 Children outside one of the homes that was damaged during the US raid in al-Bayda governorate in central Yemen against AQAP on January 29, 2017. At least 14 civilians, including 9 children, were killed during the raid, and at least 20 homes damaged, witnesses said. A top American military commander today announced that he has completed an internal review of Donald Trump’s first military raid – an operation in Yakla, Yemen, that killed a Navy SEAL and up to 23 Yemenis – and concluded there were no lapses in judgment surrounding the operation. The head of U.S. Central Command, Gen. Joseph Votel, also told the Senate Armed Services Committee that a separate investigation into civilian casualties found that between four and 12 innocent people were killed. This is despite the fact that independent investigations (by Reprieve and others) show ten children died in the raid – including two babies and eight children 12 years and under – in addition to an 80 year old tribal elder and several women. General Votel said he sees no need for additional investigations. “Eight Yemeni children lost their lives to President Trump’s botched midnight raid on their village, and today their families were delivered another blow: President Trump’s government has conducted a secret, internal review and determined they don’t count as innocents. “A secret, internal review that contradicts eyewitness accounts, re-classifies innocent children as combatants, and underestimates the number of dead is simply not good enough. Both the American and Yemeni bereaved families deserve more. They deserve to have their children counted among the dozens of innocents harmed. They deserve to know why their own eyewitness accounts have been discarded. And they deserve an apology. “We urgently need an independent, transparent and full scale public investigation into just who was killed and what the decision-making process was that authorized such a mission. If this really was a recklessly planned catastrophe of a mission, as independent reports and the eyewitness accounts from Yakla suggest, then we must do everything in our power to make sure such mistakes don’t happen again.